Spring is around the corner and that means this Build a Cherry Blossom Sensory Bin is perfect for little ones to explore textures and signs of spring through sensory play! We even added a little math into the cherry blossom building fun, too. 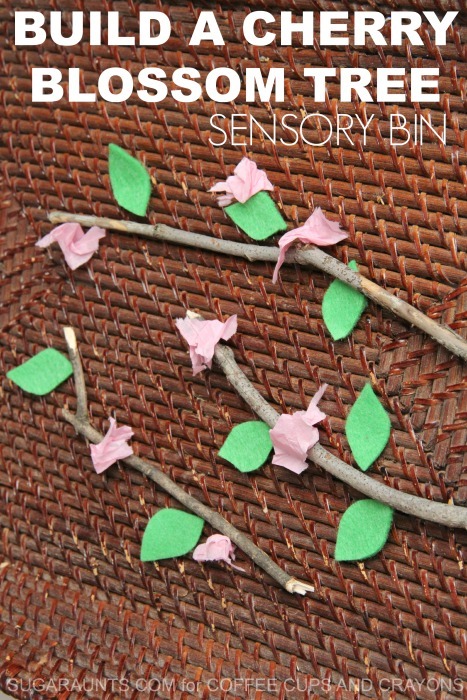 This cherry blossom sensory bin is a Spring version of our Build an Apple Tree fall sensory bin. 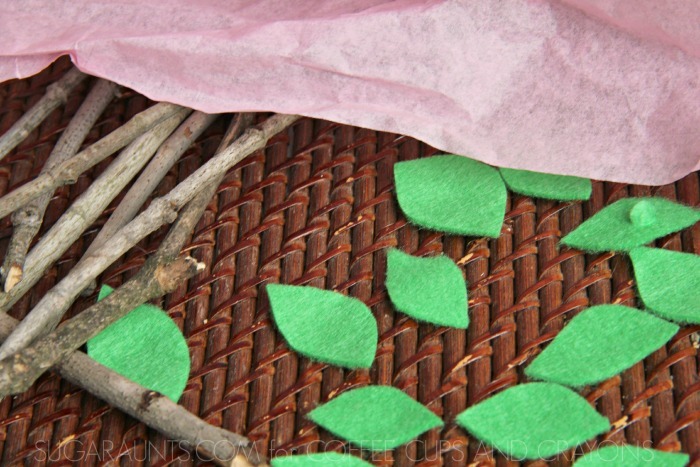 Allow your child to pull pieces of the tissue paper and crumble them into little balls. Tearing and crumbling tissue paper is such a great fine motor activity. The act of tearing and crumbling works the intrinsic muscles of the hand, which are important for strength in activities like coloring and handwriting. Sensory play is such a great environment for learning. 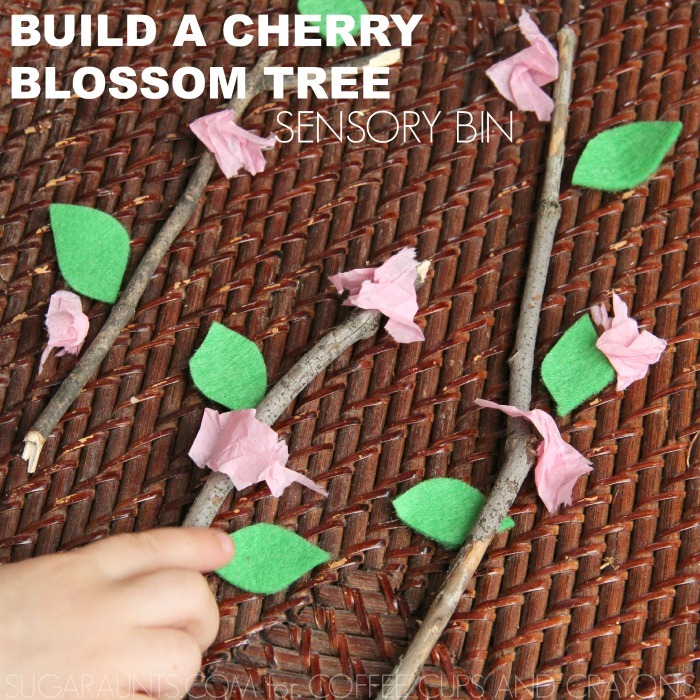 When the sensory bin is ready, show your child how to build branches of a cherry tree. They can arrange sticks to resemble branches and add leaves and blossoms. 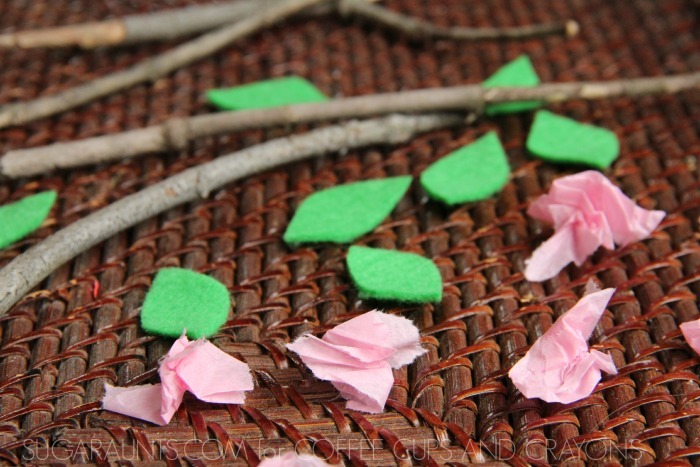 When we played with our sensory bin, I encouraged my kids to create patterns using the leaves and the blossoms. This simple activity was a great way to sneak in basic math pattern ideas. Ask your child questions like, “What textures do you feel?” and “Describe the sticks and the leaves” as they play to encourage descriptive language during sensory play.